March’s MiniMoFo prompt is for filled or stuffed food. 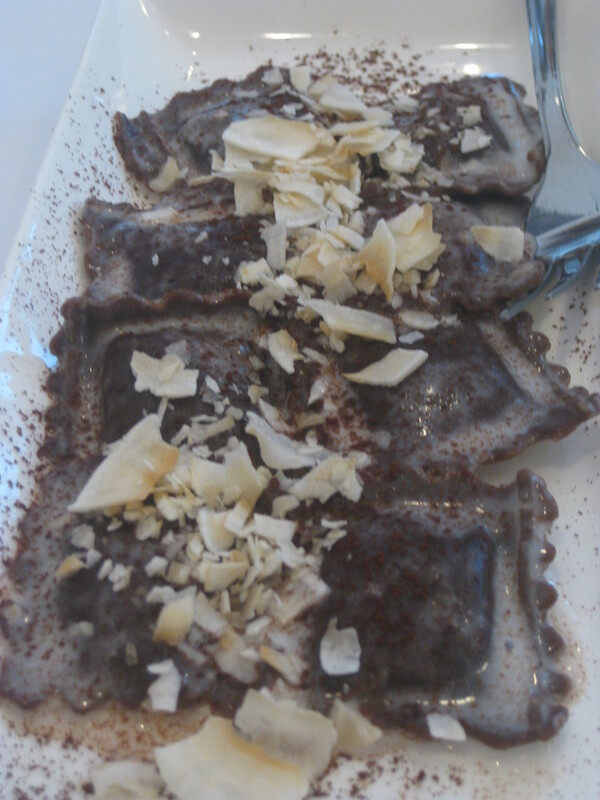 It seems like the ideal time to share a meal that consisted of both sweet and savoury ravioli! I don’t know about you, but for me the name The Pasta Factory conjures up a fast food place: cheap, cheerful pasta dishes. In reality though, it’s a lovely restaurant just outside the Northern Quarter in Manchester, with fresh, delicious Italian food and a very respectable vegan menu. It’s also a bit pricey, so be aware of that before you go. Also note that not all the dishes from the online menu are available on the day, so don’t pin your hopes too much on one specific dish in advance. There were vegan options on both the lunch menu (cheaper, but less exciting dishes – things like arrabbiata) and the main menu, which had three good options, and a veganisable starter platter. 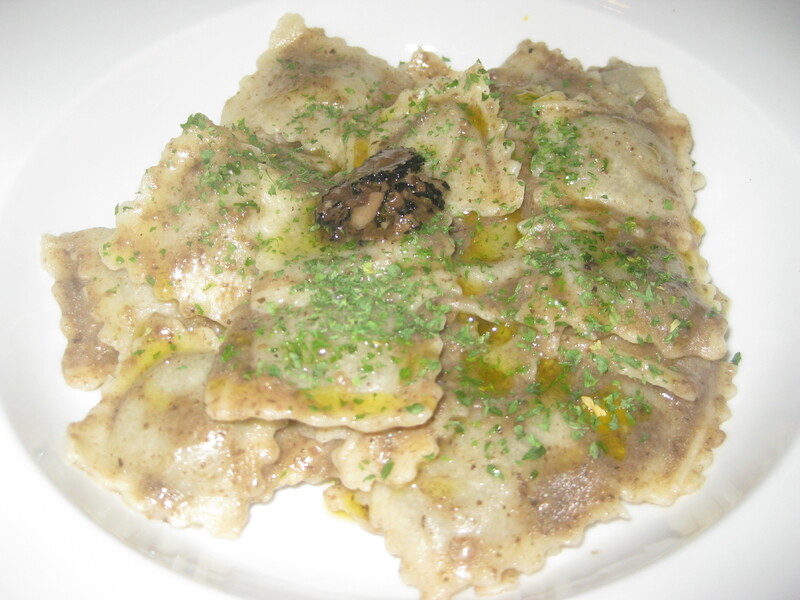 I only had a main this time, and this mushroom ravioli jumped off the page. 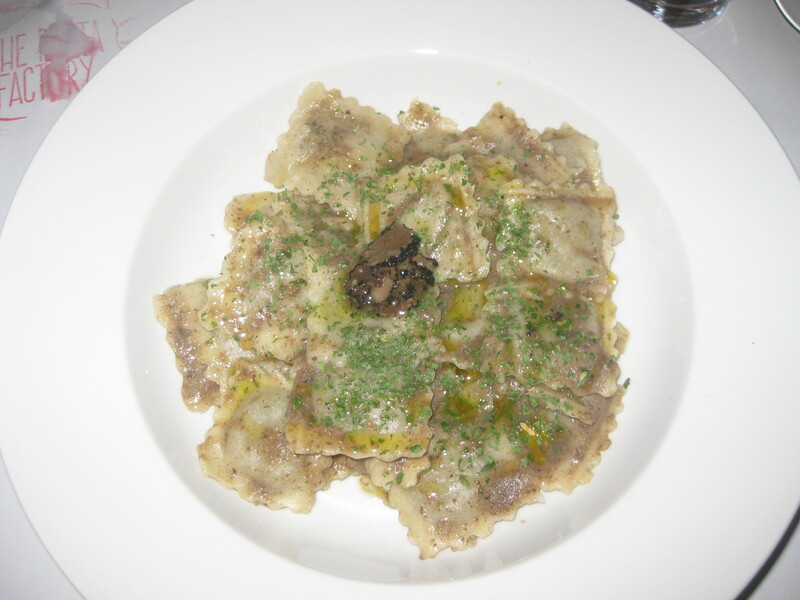 It was absolute perfection: earthy mushroom flavour, perfectly cooked pasta, truffle and oil for taste. 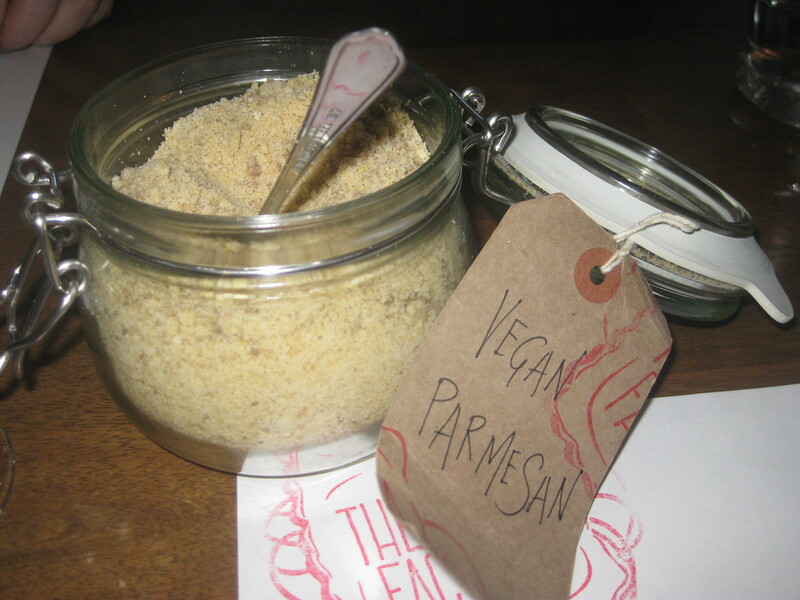 Oh, and vegan parmesan as well! Good news on the dessert front: there is a chocolate ravioli dish on the main menu which is vegan, and always a vegan sorbet on the board (it was coffee and amaretto when we visited). You can never have too much ravioli, I always say, so I got this as well. The chocolate pasta was nice, and there was a nice fig filling and coconut chips, but honestly all the flavours could have been stronger. Still, this is a small complaint: it was lovely. I very rarely order pasta when I eat out, so a pasta restaurant was an unusual choice for me. I think it’s hard to be bowled over by pasta, but this place really did the trick. It was very impressive. Even more impressive: all the wine and beer was vegan. Cheers to that! This entry was posted in Travel and tagged MiniMoFo, Pasta Factory Manchester vegan, vegan Manchester, vegan travel. Bookmark the permalink. How interesting, a whole pasta restaurant? I’ve never had sweet pasta before and I’m not sure I can imagine it! I guess, why not. I really need to head back up to Manchester and check out the vegan food there! I think I’ve seen chocolate ravioli on Masterchef a few times and been very intrigued – it actually isn’t as strange as it sounds, and is definitely worth a try! It was quite exciting to have sweet and savoury versions of the same dish! I really like the Pasta Factory and the effort they go to. And their take-away cheeze is lovely! Oooh, I’ll look out for takeaway goods next time I’m there! Yes! Places with vegan wine always get a gold star from me!